The final trial of the year was held on Eskragh Lough in Co Tyrone on Saturday 23rd October. The weather held fine (despite previous forecasts) with a westerly breeze. Some sunny spells had the fish coming up to the surface - they were down and up all day depending on the weather. Julie Gerry and Linda Straghan were drawn together with Harry McAteer Snr as their boatman. Linda had a beautiful baby boy just over 2 weeks ago and we were delighted to see her and admire Sonny's photos and know all was well. Julie had a magnificent total of 10 fish on lures, the largest being 53 cms, and Linda also had two good fish, one of which was 50 cms. Orla Sweeney from Dublin fished with Derek McConville as her boatman and had one fish on a minkie and hooked into a fair few others. Susan Brown and Jenny Casey were drawn together with Harry McAteer Jr as their boatman. Jenny caught 2 lovely fish on lures with Susan managing to hook one eventually on a black & peacock spider! Fred from Eskragh Lough had very kindly tied a beautiful salmon brooch for the winner and this was presented to Julie Gerry the winner of the trial with 10 fish. 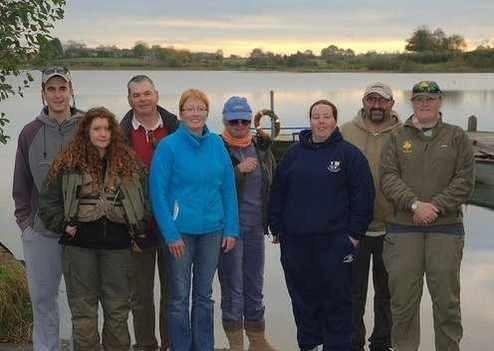 The 5 ladies caught a total of 16 fish on the day and rose or lost many more. Eskragh is a brilliant venue - all the fish were in perfect condition and were carefully released to fight another day. The top boatman on the day was Harry McAteer Snr with 12 fish to his boat. We were very grateful for the boatmen's help - its so enjoyable to get to fish without worrying about lifting or operating engines, drogues, or going aground. Everyone was very glad to get into the heat of Quinn's Corner bar afterwards and enjoy a chat, some food and many hot cups of tea.